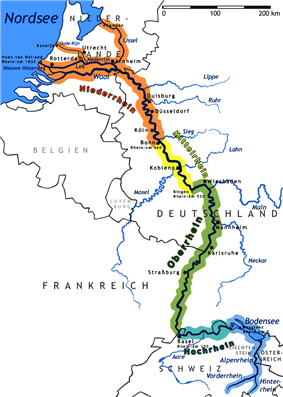 The Lower Rhine (German: Niederrhein; kilometers 660 to 1,033 of the Rhine River) flows from Bonn, Germany, to the North Sea at Hoek van Holland, Netherlands (including the Nederrijn or "Nether Rhine" within the Rhine–Meuse–Scheldt delta); alternatively, Lower Rhine may be cited as the part upstream of Pannerdens Kop, to the exclusion of the Nederrijn. Almost immediately after entering the Netherlands, the Rhine splits into many branches. The main branch is called the Waal which flows from Nijmegen to meet the river Meuse; after which it is called Merwede. Near Rotterdam the river is known as Nieuwe Maas, and becomes the Nieuwe Waterweg flowing into the Northsea at Hoek van Holland. The Nederrijn refers to the more northern former main branch of the Rhine, which flows past Arnhem; splits off the IJssel which flows into the IJsselmeer and then splits into the Lek River and the Kromme Rijn at Wijk bij Duurstede. The Lek flows into the Merwede. The Kromme Rijn continues past Utrecht, becomes the Leidse Rijn, then Oude Rijn and flows into the Northsea at Katwijk. There are other minor branches such as the Vecht, Hollandse IJssel and the Noord river. The German "Niederrhein" is applied both to the German section of the Lower Rhine river as well as to parts of the surrounding Lower Rhine region.